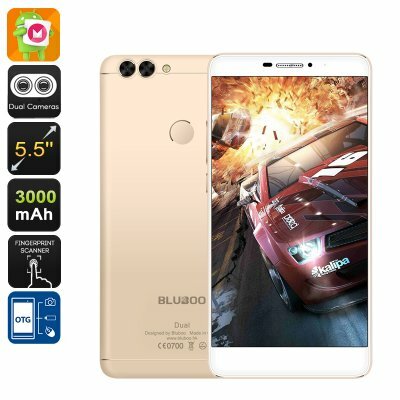 Successfully Added Bluboo Dual Smartphone - Android 6.0, 5.5-Inch FHD, Dual Camera, Quad-Core CPU, 3000mAh, 4G (Gold) to your Shopping Cart. The Bluboo Dual is a Chinese smartphone that introduces you to the next generation of mobile photography. Packing dual rear cameras, this Android phone allows you to snap absolutely stunning pictures and video – letting you capture all those special moments in life in breathtaking detail. Two cameras mean that you’ll be able to shoot sharp images that feature great dept and stunning detail. Along with its dual LED flash lights you’ll be able to snap the perfect shot at day and night. Additionally, this Android smartphone comes with a 5MP front camera, allowing you to engage in high quality video calls and snap the perfect selfie while out with your best friends. Packing a Quad-Core CPU that has been clocked at 1.5GHz; the Bluboo Dual is a phone that is capable of dealing with the most demanding of tasks. Along with its 2GB of RAM it allows you to play demanding games, watch FHD movies, and engage in excessive multitasking sessions without dropping a frame. Featuring 16GB of internal memory and allowing you to slip in a 256GB memory card, this Chinese smartphone is guaranteed to offer you with all the space needed to save your favorite games, media, and files alike. From now on there won’t be a single moment of boredom anymore as, with this 5-inch smartphone, you’ll be able to enjoy countless hours of mobile entertainment at any time of the day. An absolutely stunning 5.5-Inch FHD display lets you enjoy all the phone’s features in mesmerizing resolution. With its extra-wide viewing angle and by displaying vivid colors, this 5-Inch smartphone is sure to provide you with a true cinematic experience every time you put on a movie. Additionally, the display of this Android phone features the latest double layer TP technology, meaning that this state of the art display lets you use your smartphone even while wearing gloves. From now on you’ll be able to use your device outside during the winter months without catching a cold. Running on an Android 6.0 operating system, the Bluboo Dual comes along with a fast and smooth performance – providing you with a great user experience. Its 4G connectivity allows you to stay connected to the web at any time, letting you enjoy the fastest mobile data speeds out there no matter where you’re located. Additionally, this 5-Inch smartphone supports two SIM card slots – further increasing your mobile connectivity. Not only does this Android phone allow you to switch in between two network providers, it also lets you be reachable on two phone numbers while using just one device – making this Bluboo phone a perfect platform on which to separate your work and private life. The Bluboo Dual comes with a 12 months warranty, brought to you by the leader in Dual-SIM smartphones as well as wholesale electronic gadgets..